One of the great pleasures in life for an early riser like myself is to watch the sun rise with a cup of coffee in my hand and a gentle curl of smoke rising from my grill or smoker. A peaceful grill session free from distraction is a wonderful way to start your day. I urge you to try it for yourself. 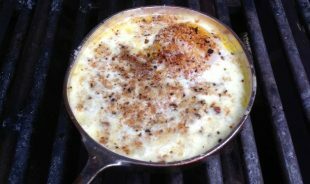 A variation on “shirred” (baked) eggs, just crack eggs into a buttered skillet and top with heavy cream, grated Parmesan cheese, fresh herbs, and homemade bread crumbs. Indirect grill them with a whiff of oak smoke. Try it once and it might just become your new favorite way of preparing eggs. Breakfast just isn’t complete without bacon. I take most people’s favorite breakfast meat, cut it thick, candy it with maple syrup and brown sugar, and cook it on the grill rather than in a skillet. Using raised rail grates like GrillGrates with help minimize flare-ups. 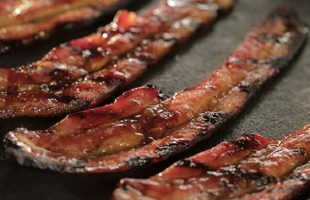 On the grill, the brown sugar and maple syrup coat the bacon in a delicious sweet candy crust that interplays beautifully with the smoky, salty bacon. It’s like breakfast and dessert rolled into one. You’ve heard of beer-can chicken. How about the beer-can breakfast burger? Think of it as the slow smoked take on the fast-food breakfast sandwich. This version is made with pork breakfast sausage rather than ground beef, and it is cooked in a smoker, making it perhaps the only breakfast sausage out there with a smoke ring! 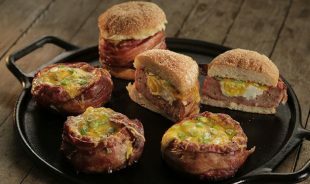 Grilled English muffins serve as the ideal vehicle for this flavor explosion of sausage, bacon, egg, and cheese. Now THAT’S what I call a breakfast of champions. 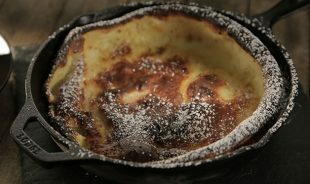 A cousin of the popover and Yorkshire pudding, the mile-high pancake is crisp and rich and puffs dramatically on a hot grill. 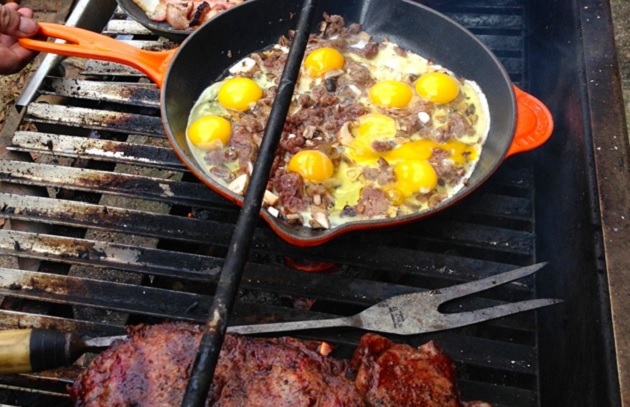 One of my favorite grilled breakfasts, it’s a great dish to make on a gas grill. To give it a smoke flavor, put wood chips in the grill’s smoker box if it has one. It is said that breakfast is the most important meal of the day, and to me that means it should be made on the grill. Have you grilled your breakfast? Share with me on Facebook, Twitter, or Instagram.